With World Osteoporosis Day coming up, what a great time to have a think about how healthy your bones are. There are some things that impact our bone health that we can't change: being female, getting older and our genetics can but us at greater risk of developing osteoporosis. 4. Exercising regularly, particularly weight bearing exercise e.g. walking or weight lifting. I found this food product in the "Health Food" isle of my supermarket. Kale Chips - Pineapple Coconut flavoured. These chips are 36% Fat and 25% Sugar! And at around $140/kg, they aren't so healthy for your wallet either! Who’s heard about Meat-Free Mondays? It’s all about being vego for 1 day a week, every week. Sticking to this eating pattern can mean – less saturated fat in your diet, eating more veggies, trying veggies in new ways and setting up lifelong healthy habits. I think the meal that I struggle making meat-free the most is dinner – meat free meals no steak and veg, salad without the chicken, and no meat in the curry. But, it doesn’t have to be hard. Eggs are a great meat replacer – omelets or frittata with lots of low joule vegetables, boiled egg in salad or scrambled eggs in stir fries. Chickpeas, lentils or tofu work well in curries. Who’s got a favourite vegetarian dish? Perth Diet Clinic has taken advantage of making a series of videos for your information - all available from your computer or tablet. Click here to see the videos available. 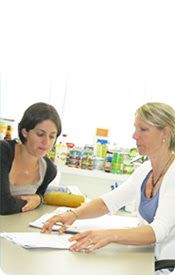 The Perth Diet Clinic has professionally qualified dietitians who consult on both an individual basis, as well as to industry and business. These accredited dietitians can help you with a weight or cholesterol problem, give advice on food services, or give lectures as required. We can also help with nutritional queries and information, and assist you with a wide range of nutrition and food related health problems. We do bulk bill when clients are on a Medicare plan. The contact details for our main office and our Web Site and email. The addresses and phone numbers of our various consulting venues are shown under Consulting Venues & Times.